David and Mary Thompson, undated. June 10, 1875: The last payment made on the [Union] church today, and it is finished, I believe. June 14: Some time spent in calling round in view of the dedication of our church. June 18: The matting is put down in the church [Shin Sakae Church], the clock is hung, the table is made, and tonight most of my work in it is done except to put some fresh flowers there tomorrow. The Lord accept it as his own house into which he will come down and dwell. And fill our own hearts and the hearts of our brethren with love, so that we may be one in truth. June 19: It was cloudy this morning, but the after-noon grew pleasant and the house was packed at the dedication services. Every missionary in Yedo [Tokyo], with scarcely an exception, was present and those too whose contributions brought us such timely aid. A happy day and much kindly feeling shown, and to those who could understand a solemn, interesting time. July 6: Attended Mr. Bingham’s large party yesterday evening. The fine illumination did the eyes good, and the inside decorations of flowers, vines, and ferns were very handsome, and the dress of some of the ladies too, was very handsome, but it is always a trial to be obliged to go to such places.—Saw some of the Japanese high officers. David was kept busy entertaining them. A mixture of nationalities it was. The storm seemed to have kept few away. July 10: At the dedication of the beautiful new native church in Yokohama today. July 16: Our new servant came this morning before we were up. Trying to teach her is amusing rather than otherwise. She knows nothing at all of how foreigners live, what they eat, how it is prepared, or how they eat it. And worse than all, she cannot understand what I saw [say?] to her as the old ones could who were accustomed to me. The carpenter who is building our house brought to us a young girl, a relative of his whom we agreed to try. Her father threatened to make her some man’s concubine. To save her from this sin and shame we thought we should take her.—And now, we must pray for these both. How can we expect them to be good servants otherwise? July 31: We have moved to our unfinished new house today. The heat was intense until evening, and then the blessed rain came pouring down cooling and refreshing and filling our waterpots. Dec. 11: Another month passed without any great events taking place, and yet, if our soul’s history were clearly understood by ourselves, great. I have commenced having woman’s meetings on Saturday after-noons at the houses of church members in different localities of the city. O with what a trembling heart I began, but God is better to me than I expect. O let me trust him and never fail to go forward. We have had three meetings. One Sat. in the month I am to be free….—Nov. 29th the Empress opened her new college for girls in person. David was much pleased with all the exercises. How this will affect the girls schools taught by missionary ladies we cannot tell.—A meeting of missionary ladies of Yokohama & Yedo was held last month at Miss Youngman’s. It was proposed to have them every three months alternately at Yokohama and Yedo. 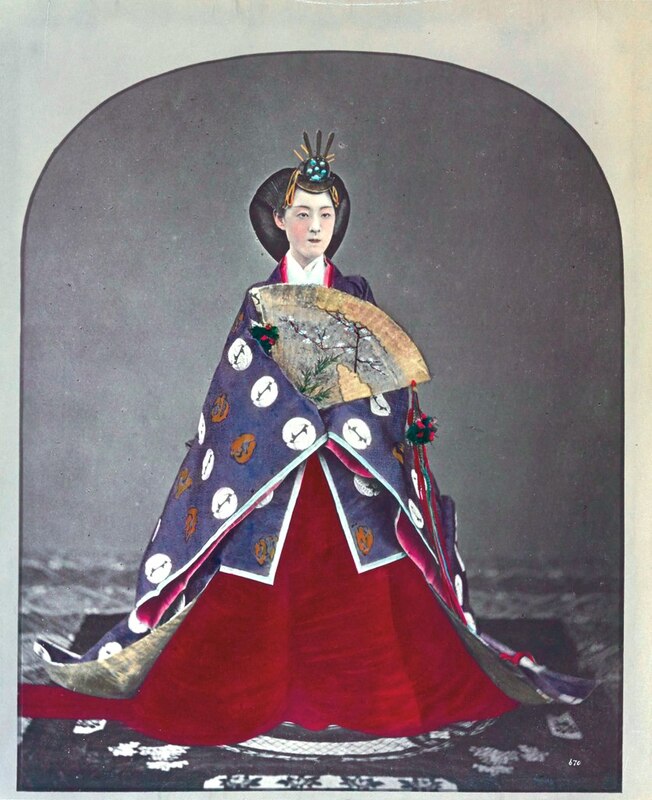 "Empress of Japan" hand-colored albumen print. Published by Stillfried & Andersen, circa 1873. Via Wikicommons. Dec. 22: On the 20th David lent twenty-five dollars to a Japanese who had been here twice before and made various pretentions of wanting to hear the religion of Christ and of forty of his country-men who were waiting for a teacher to be sent them. But he was a thief and we bear the consequences. Jan. 21: A troublesome talk with Miss Youngman again. I thought I had the last long ago. I must be free from the school ere long. There are so many other more important things that I should and cannot do. Jan. 24: Futagawa telling us of Mr. [John] Piper’s talk with him trying to induce him to come and work for the Episcopalians.—I am afraid I said too much to Futagawa about his own impracticable notions about a union of all Japanese Christians at no distant day. Feb. 18: Learned on going to school today that Iku was taken home yesterday and perhaps will not return. Her father’s conduct and her home matters make it very trying for her. And he hates Christianity.—Perhaps Miss Gulich [sic.] will come and assist Miss Youngman. This will be a great relief to me if she comes. Mar. 12: Eight persons were baptized today. I have not been able to go out, but my Sabbath school came to me and I taught them this morning….Miss Youngman came in to see me after service. O I am sorry, so sorry, that I should have been thrown off my guard by her, that I should have entered into another fruitless, sinful talk with her. However true, I said things that I should not have said. O, with the help of the Lord, in all the future, I would go peacefully on. I am so thankful that our connection in the school is so soon to cease. Thus I will be greatly out of the way of temptation.—I will tell her I am sorry that I did not speak the truth in love. Mar. 13: How we joy at the Government proclamation that has come out today! After the beginning of April our Christian Sabbath will be considered the rest day in Japan. Mar. 15: I taught my last day in school with Miss Youngman this day. Miss Gulich [sic.] is fully established and ready to begin work. I told them fully the state of my different classes and resigned them to their disposal. I was struck with the marks of affection the scholars showed, especially the older ones. It was not without real regret I parted with them, although my being free from the school will be a great relief. Mar. 29: Mr. Carrothers’ resignation has been accepted by the Board. Every one seems sorry for poor Mrs. Carrothers. She will have to leave her school to which she is so much attached. David goes round groaning over our weakness and want of grace. O that the Lord would bless our mission and give healthful bodies and souls to its members.—Mr. Loomis is obliged to go home on account of his health. April 18: Yesterday was my birthday, but I did not recall the fact the whole day, so occupied was I with all the sad and perplexing things that have arisen in the church recently. Awadzu’s effort to break down the rules of the church and throw all things into confusion! Futagawa’s plottings, deceit, and untruth! O may God open the way and show the way to establish this church on a firm basis, and root out from it the evil that requires such frequent sifting.—David dismissed Futagawa from his service on the 10th. The girl’s school has been transferred entire to Mr. Green’s church. May 7: The second anniversary of our wedding day….At present daily life is not without pain and care, but the dear Master often makes his loving presence such a reality and gives such precious hopes and promises that the suffering may joyfully be born. May 23: Mrs. Carrothers has been staying with us for more than a week and will be here until her rooms in [Mr.] Hara’s school are prepared. Mr. C has begun his work at Hiroshima. June 17: Returned from Yokohama this evening after a stay of three days. I visited and called upon everyone I wished to, and have come home fully satisfied. I know not when I shall be able to go again. The dear friends, how I love them, and how pleasant they made my stay. Oct 19: As far as I can I have all the house-hold matters set in order….And then I wait for what God shall send me. I trust him, love him, in Christ believe, commit all to him, and will he not give me the desires of my heart? His sure word tells me so. My heart is at rest. For my darling husband, too, all shall come well. March 23, 1877: On the 2nd of November came our little daughter, a precious gift from the Lord [named Ruth Rea]. From that time till now, how much I have suffered, how care has weighed me down some-times! I know the Lord is teaching me “Cast all thy care upon him who careth for thee.” Oh, it would seem that the lesson should be easily learned. I have often in part learned it, but my foolish heart so soon forgets. How merciful of the Lord to give me this same needed lesson over and over again! Feb. 8, 1878: Again I am waiting for what the Lord shall send me, life or death; joy or sorrow; long continued pain or sudden relief. I pray for a quiet trusting heart, and not over concern about Ruth. Will not our loving Father bless us and cause all things to work for our good? April 1: On the night of Feb 8th at eleven o’c[lock] our second little daughter was born [named Mary Calhoun, nicknamed “Mamie”]. And now my days are mostly filled with the care of these little ones. I think it no low task to have two souls to train for God. It is so easy to make mistakes whether in taking care of their bodies or in directing their minds. How we need continually to be led by the Spirit! I never before have felt as I do now how entirely dependent I am on God for everything. He has blessed me abundantly, and yet when circumstances a little adverse have arisen, how quickly has my heart rebelled! For Christ’s sake, for Christ’s sake alone I am blessed. Frances Gulick had been teaching in Japan and was officially appointed a Presbyterian missionary in 1876. According to the report published in the 1875 General Assembly minutes, Mrs. Carrothers’ boarding school had 28 girls, and Miss Youngman’s school had 8 boarders and 15 day scholars. In the spring of 1875, Mary had begun studying with Futagawa: translating the Bible into Japanese, the history and poetry of Japan, and Buddhism. Presbyterian missionary Rev. Oliver M. Green, based in Yokohama. He will take over Rev. Carrothers’ church in Tokyo after Carrothers’ resignation. Mary Parke and her husband David Thompson served as missionaries to Japan for over five decades. Read about their time in Japan.